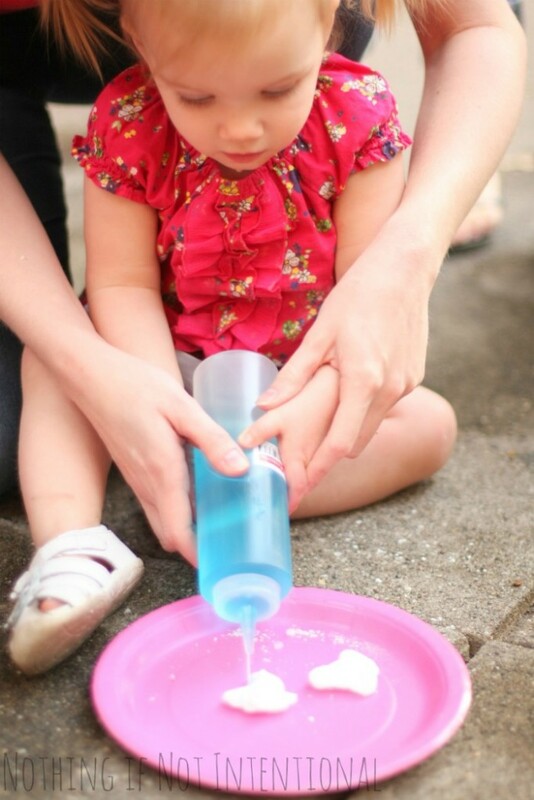 Airplane Play: Airplane Sensory Bin, Personalized Coloring Sheet, and Frozen Fizzing Airplane Fun! 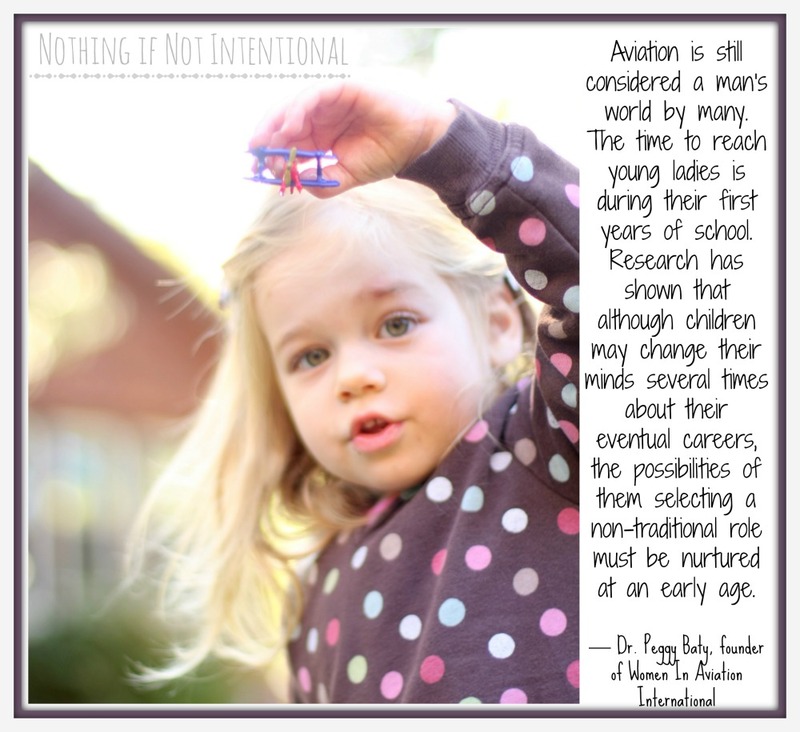 Our oldest daughter shares her daddy’s love of airplanes to such a great extent that she says she wants to be a “Mommy Pilot” when she grows up. So when we started preparing for her third birthday party, pink airplanes seemed like a fitting theme! I have an entire post devoted to the airplane party details–a homemade pink airplane cake, airplane cupcake toppers, airplane chocolate, airplane suckers, and even DIY airplane crayons to give as favors. 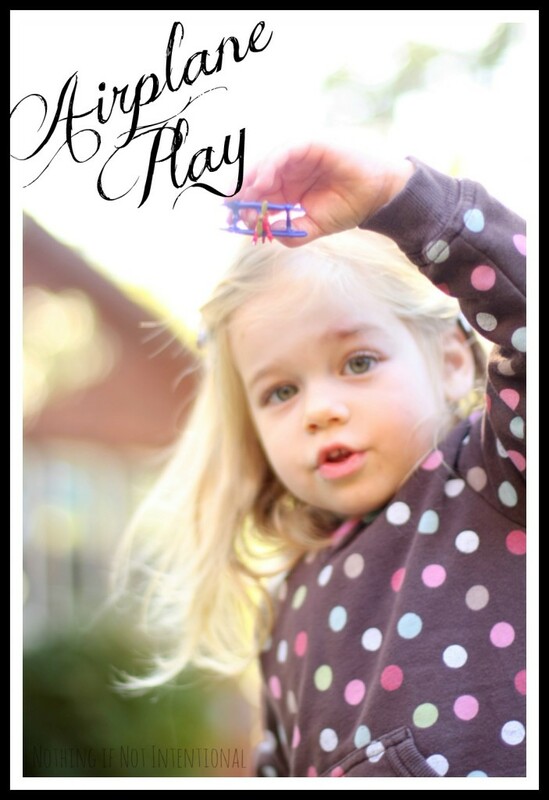 But today’s post is all about airplane play! I am a big, big fan of water play. 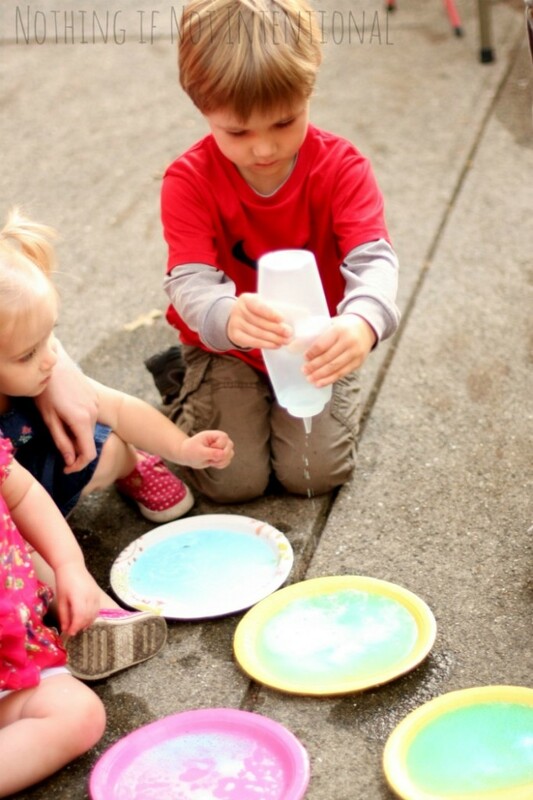 Kids LOVE water, and clean up is a breeze (especially when you’re outside!). 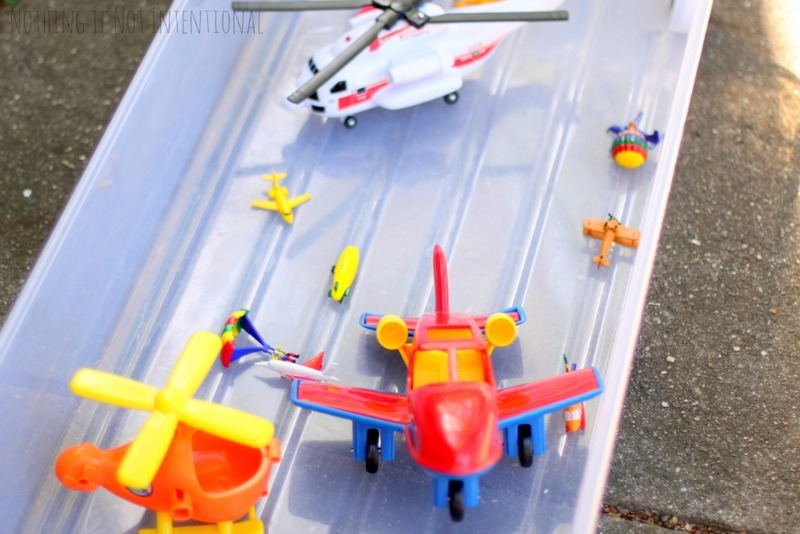 For our airplane bin, I took an under-the-bed tote (like this one), filled it with water, added blue food coloring (to mimic the sky), and threw in all of the waterproof airplane toys we could scrounge up. By far the best part of our sensory bin was the In The Sky Toob. Safari Ltd sent us one of their toobs to try, AND they’re generously offering our readers the chance to win a Toob of their own! Stay tuned–giveaway starts Thursday (November 7). As expected, the kids jumped right in. There were a few pretend play ideas that the adults could throw in every now and then (“Do you need any tools to help you fix the plane? Oh, that plane looks dirty! Are you giving it a bath?”). But the kids really didn’t need instructions or guidance. They knew how to fly, play, splash, and laugh without any help from us. Because we all know how hard it is for kids to sit still through dinner, I put coloring sheets and crayons on all of the tables. Paper Built Shop customized this airplane coloring sheet for our party. You can get your personalized pdf for just $4 and use it to print as many copies as you need. 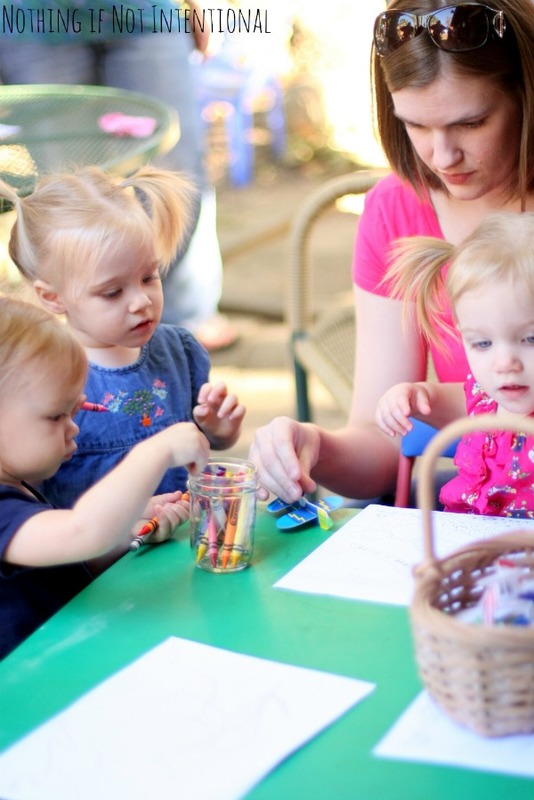 My one piece of advice: while mason jars are a cute way to store crayons, glass jars and kids don’t mix. The jars break when dropped on concrete. What was I thinking?! My FAVORITE way to watch the kids play was with these fizzing frozen airplanes. We used Fun-A-Day’s baking soda mixture without the Jell-O (Mary Catherine has perfected the proportions. Skip the trial and error and follow her instructions!) and added the paste to these airplane molds (the same ones we used to make airplane crayons). I made several batches and kept them frozen in freezer bags until right before the kids were ready to play. They lose their shape quickly, so don’t bring them out too early. We then gave the kids condiment bottles (like these) and droppers (these) filled with vinegar and blue food coloring. They squirted, squeezed, and dropped the vinegar on their planes; both kids and adults were mesmerized by the chemical reaction. 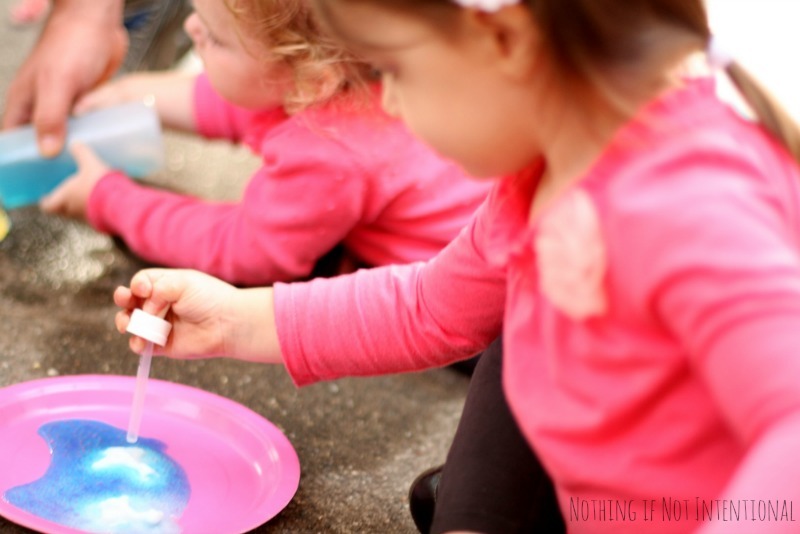 I loved watching the kids exercise their fine motor skills and “play” with chemistry! Want more party fun? 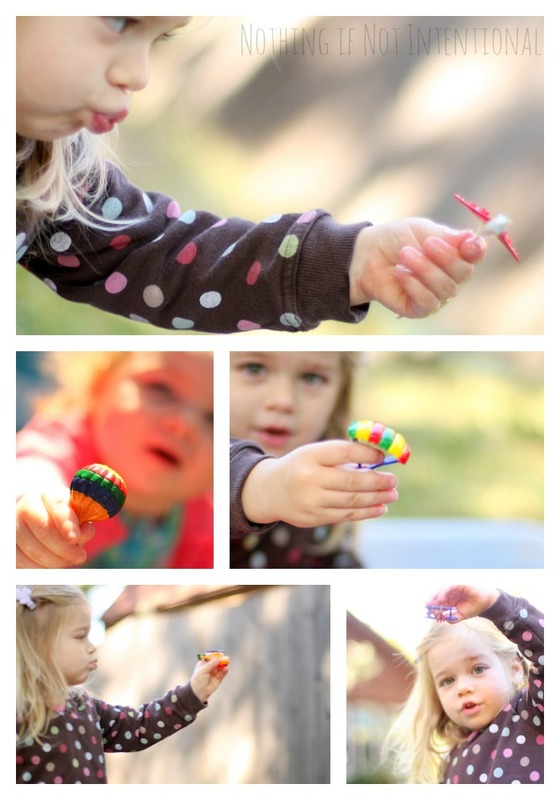 Check out our baby’s Pink Lemonade and Pinwheels First Birthday Party. 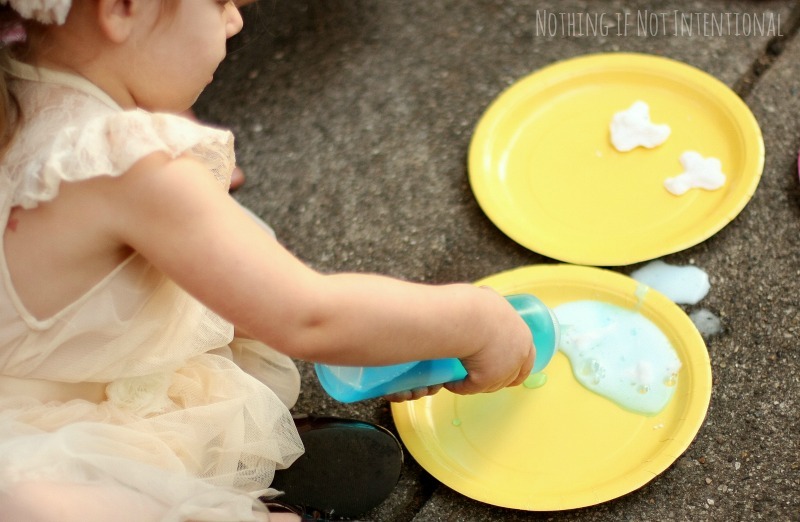 Her party guests thoroughly enjoyed playing with the Birthday Bubble Bar. Pingback: Airplane birthday party ideas for your future pilot. ADORABLE! 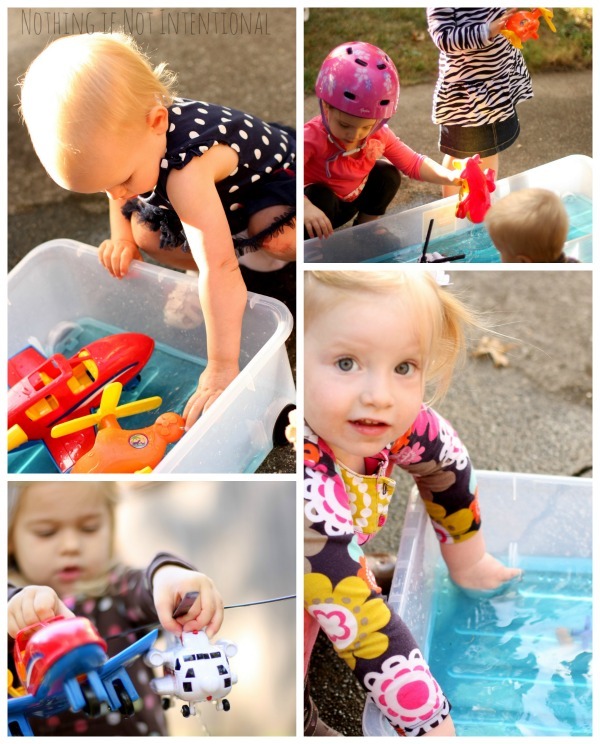 Pingback: 25 Resources for a Preschool Transportation Theme - Fun-A-Day!